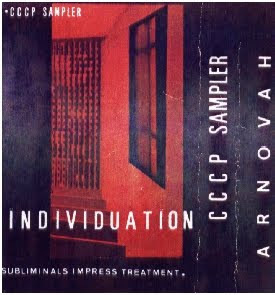 Another great release by mysterious french artist Arnovah. This is the last Bog-Art post for now... Many thanks to Hubert for those rips ! Needless to say, a must have ! 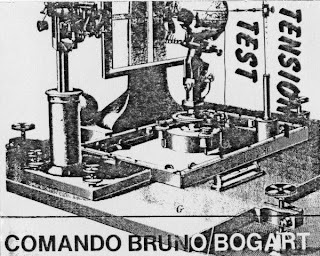 Mail collaboration between four legendary artists from the eighties' industrial cassette network : Al Margolis (If, Bwana), Rafael Flores (Comando Bruno), BogArt and Yutaka Tanaka (S·Core). Der Schwarze Kanal is BogArt + Chazev + M.T.P. Sp III. 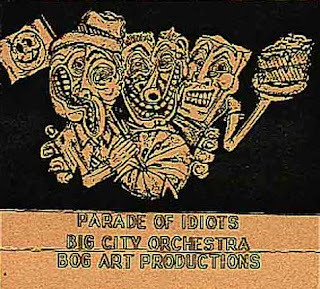 Recorded live at Odeon, Münster, 11-07-1985. 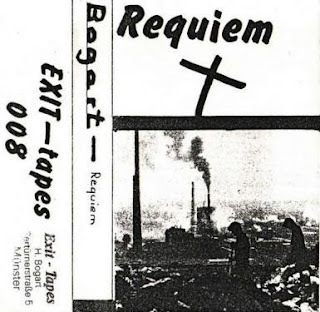 "Requiem" was one of the first BogArt tapes. I've met Hubert Haverkamp through the mail in the 80s as he was involved in the cassette network. 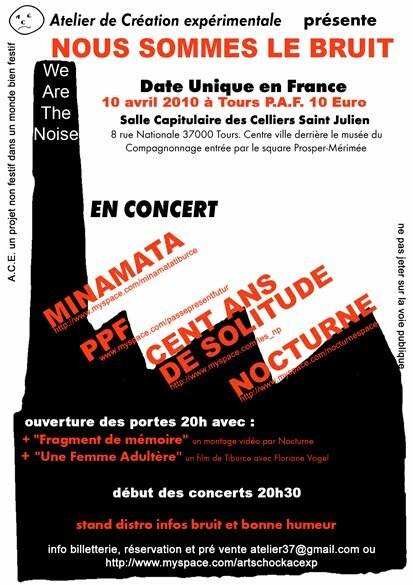 Hubert began playing drums at the age of 6 years old. In the early 80s, he was a member of the band Legion Fondor. 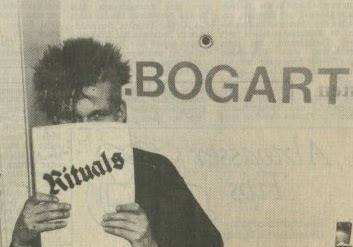 In 1984 he founded a first cassette label, Exit Tapes, while he was doing solo experimental music under the name BogArt. Then he created the Bog-Art label and became a member of the band Mortification To The Flesh. 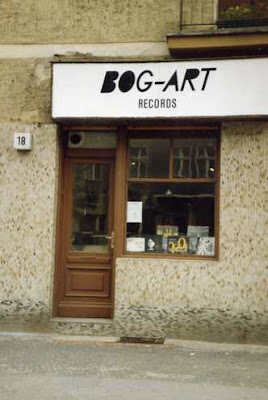 The Bog-Art label released mainly cassettes in the mid-eighties, and then vinyl after the late eighties ; Bog-Art also opened a record shop in Berlin in 1990. Double cassette wrapped in wooden sandwich. 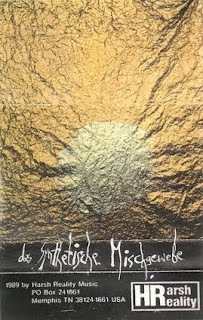 Doc Wör Mirran, a band whose open membership is a part of the philosophy, has many releases in many different genres. 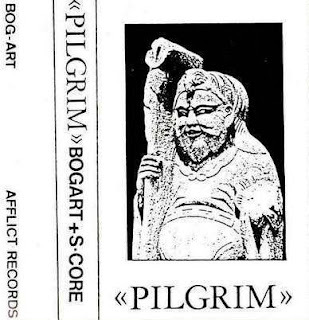 On that rare and great double cassette, Doc Wör Mirran is Joseph B. Raimond, Peter Schuster (P.C.R., Tesendalo) and Ralf Lexis, exploring the experimental side of the band, between ambient and noise. 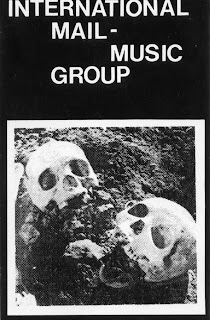 From Empty Records website: "This three piece band was, next to Doc Wör Mirran, the best known and admired industrial/experimental band to come out of the greater Nürnberg area. Comprising Adrian, his brother Constantin as well as Peter Schuster, known for his work under the name Tesendalo, they gave several concerts in the Nürnberg area in the late 1980s, released several cassette only releases on various labels as well as one LP on eMpTy Records, before disbanding around 1990 or so". B1. Wenn Ihr Schwalben Werdet, Werden Die Steine Schreien I.
B4. Wenn Ihr Schwalben Werdet, Werden Die Steine Schreien II.